We are the leading manufacturer, exporter and supplier of Azospirillum which are formulated as per the requirements of client. Our team of experienced professionals are monitoring the stages of quality control to deliver best products. Azospirillum are offered in safe and attractive laminated poly pouches. These solutions are available at affordable rates. Azospirillum is nitrogen fixing bio inoculant suitable for all crops except legumes. GreenMax AgroTech is capable to produce ten tonnes of technical grade Azospirillum brasilense / Azospirillum lipoferum per day. This product is also available in combination with Azotobacter as combined formulation. Gmax Nitromax is combined product of Azospirillum and Azotobacter. Azospirillum works well with all crops where as Azotobacter gives excellent results when soils have rich organic matter content (more than 2%). As a combined product of Azospirillum and Azotobacter, Gmax Nitromax combines the benefits of both inoculants in a single formulation. The product is available as liquid formulation and lignite carrier based formulation. Sticking agent – CMC – 1%. Carrier based formulation is available in attractive one kg laminated poly pouches. The packing is moisture proof and well tolerates transportation and handling. The product is also supplied in bulk packing of 50kg/25 kg sizes in HDPE bags. Liquid formulation is available in one lr HDPE containers and in 200 lr barrels. 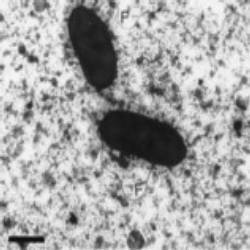 Azospirillum is an associative type of bacteria, living in close proximity with the root zone. During unfavorable conditions it forms cyst which helps to tide over unfavorable conditions. Thus it thrives and maintains its population during favorable conditions. It fixes atmospheric nitrogen, provides 30 to 50% of nitrogen requirement of the plant. It produces plant growth hormones such as auxin and cytokinin. The mixture of Azospirillum, Azotobacter (Gmax Nitromax) and phosphate solublizing bacteria (Gmax Phosphomax) can be used for non-leguminous crops-like cereals, oilseeds cotton, vegetable and all other crops which are usually planted as seeds. For one kg of seeds about 40 grams of Gmax Nitromax product is required. Mix required quantity of Gmax Nitromax with equal quantity of Rice gruel. With this mixture, mix the required amount of seeds shade dry and after 24 hours, use the seeds of sowing. Mix 2 Kg of Gmax Nitromax with 50 lits of water. In this mixture, keep the seedling roots in immersed condition for 10 minutes and use the seedlings for transplantation in the field. Mix about 5 kgs Gmax Nitromax with 100 kgs of organic manure, keep the mixture under shade for one week and apply to the soil. Dilute five kgs of Nitromax in 100 litrs of chemicals free, good quality water. Filter the mixture with a pure cloth; use the filtered solution in drip irrigation for one acre. For liquid inoculants:Soil application Mix 3 Lrs of Gmax Nitromax liquid formulation with 100 kgs of organic manure, keep the mixture under shade for one week and apply to the soil. Gmax Nitromax is recommended for all crops except all kinds of legumes. Gmax Nitromax can be used along with Gmax Phosphomax, Gmax Tricon and Gmax Fyton to provide nitrogen, phosphatic nutrition and to provide plant protection from diseases along with plant growth promotion.